Tonight was the sun was setting on Yom Kippur, the feast of Day of Atonement, I was looking at the waxing moon. I took this photo with the SkyViewApp on my IPhone. 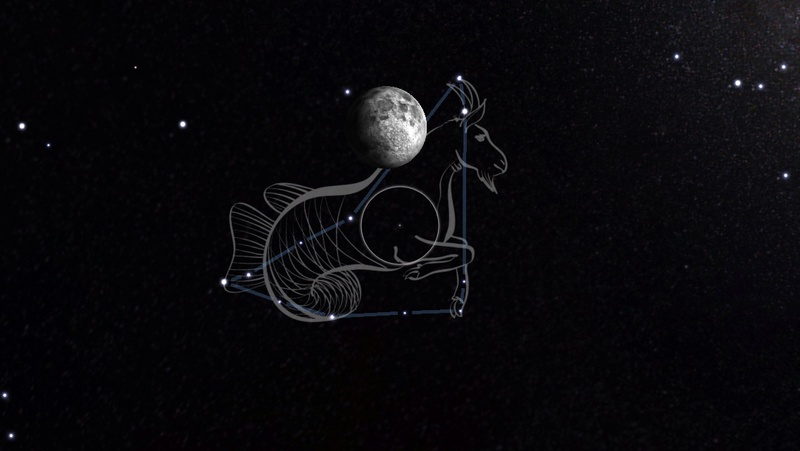 The moon is resting on Capricorn, the “Sea Goat”. Capricorn represents ‘atonement’ and shows the Church and our benefits purchased at a great price. The Sea Goat appears to be dying with its head down, the right leg folded under the body and seems unable to rise with the left. The other part of the body is like a fish that is full of life. The Egyptian name is Hu-perius, which means ‘the place of the sacrifice’. The Hebrew and Arabic name for the sign is Gedi, the ‘kid cut off‘ or ‘cut off‘. Capricorn is the Latin name and means ‘goat‘. In the Old Testament, goats were often used for the sacrifice. On the Day of Atonement, there would be two goats. The High Priest would cast lots over the two goats. The High Priest would cast lots over the two goats to determine which would be the scapegoat who was called ‘azazel’ in Hebrew. Satan worshipers use a goat in satanic worship even today, perverting the real meaning. and night unto night reveals knowledge. (3) There is no speech nor language where their voice is not heard.